The famous author Lord Chesterfield once said, the fastest way of learning a language is to know the roots of it, that is, the original primitive words of which other words are formed. This is extremely true for the Chinese Language. The earliest Chinese characters were pictographs, and contemporary characters are evolved, derived and expanded from them. By understanding the patterns and pictographic evolution of the characters, anyone will be able to recognize and master Chinese characters quickly and easily. 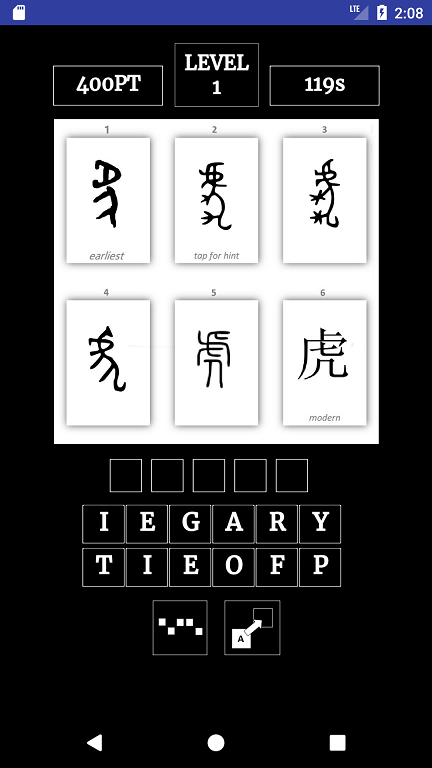 This Chinese learning game enables you to recognize the Chinese Root characters quickly by guessing an English word from multiple pictures. Every picture is meticulously hand crafted from an ancient Chinese pictograph or inscription. Yes, every single one of them! The arrangement of the pictographs allows you to see the evolution of the Chinese characters from stone-age up to the modern Chinese characters. Hints are also provided in each picture to explain how certain words are formed. For example, the combination of two pictographs can form a new Chinese character. You will learn to appreciate the Chinese characters through the hints. As a native English speaker, have you ever thought of how much time you have spent learning Chinese? Every day, day after day, and books after books. We definitely have. We grow up in an environment where English is our native first language. We learnt all our Math, Science and other subjects in English. Due to historical reasons, our education system has uniquely enforced the mandatory learning of Chinese. Many of us have struggled with the learning of this beautiful but difficult language. We definitely understand the difficulty of learning Chinese for someone who is a native English speaker, by associating visuals and words for better memory recall. After spending years of research, we have found that the fastest way of learning Chinese is through the visual imagery method of recognizing Chinese pictographs. It is also a very fun way and truly works for English native speakers. Whether you are a student, teacher, mother, child or an adult English speaker, we hope that you find our games useful as we have drawn deeply from our past experiences, and putting in our best effort and invested much time to develop this fun game. Every single pictograph we use is meticulously hand crafted based on ancient historical records of the Chinese character. These characters are originally carved on animal bones for oracle divination purposes, inscribed on bronze metals/stones, carved on bamboo sticks, or written in calligraphic form by great scholars. "No animal were harmed during the making of this app."